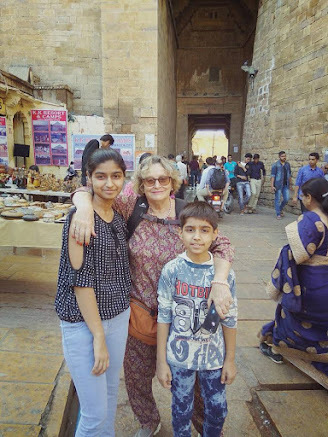 Recently Eva, an old member of this site, visited India.Meeting with her was a very refreshing experience. knowing somebody virtually and actually meeting somebody are not one thing. its first time I have meet somebody who is influenced by K, and its great to see that K teaching transforms, it makes better human being. My whole family cherish her company, her affectionate nature.I learned many things. Language is not the only communication tool, I think there was good communication even though I lack the sufficient words and sentences in this language, and in addition I have hearing problem. Well it changed my previous instance, that if you don't transform then K teaching is waste, now I feel K teaching has very positive enriching effect on life even if you don't transform. This post was last updated by dhirendra singh Sat, 07 Jan 2017. Wonderful to hear that, Dhirendra! K teaching transforms, it makes better human being. I wonder what K himself might say about a statement like this? Dhirendra, Is Eva still living and teaching in another country not too far from India? Jack, yes, she is still teaching and will continue to teach for few more years, before she retires. wonder what K himself might say about a statement like this? ;). What will you say? This post was last updated by dhirendra singh Mon, 09 Jan 2017. Good to see your post and the picture and wonderful thoughts too. This post was last updated by pavani rao Wed, 11 Jan 2017.
;) I have learned to keep my mouth shut, sir. We will let the world turn and the sun shine and the rain fall, without comment. Nice to see you here:). We should also let the words flow:). This post was last updated by dhirendra singh Fri, 13 Jan 2017. "HAVE YOU EVER sat very quietly without any movement? You try it, sit really still, with your back straight, and observe what your mind is doing. Don`t try to control it, don't say it should not jump from one thought to another, from one interest to another, but just be aware of how your mind is jumping. Don't do anything about it, but watch it as from the banks of a river you watch the water flow by. In the flowing river there are so many things - fishes, leaves, dead animals - but it is always living, moving, and your mind is like that. It is everlastingly restless, flitting from one thing to another like a butterfly." watch it as from the banks of a river you watch the water flow by. I wonder if Robert Zimmerman read Krishnamurti? I got the line from one of his songs, you know. :). I love this song. Use to play it with friends. Anyone own the truth, what is behind the curtain. It is there to be seen with the naked eyes.... blowing in the wind. This post was last updated by Rich Nolet Fri, 20 Jan 2017. Words that bring comfort and a warm fuzzy feeling of security are always welcome on this forum. One can see that by the responses on this very thread. This post was last updated by dhirendra singh Sun, 22 Jan 2017. Ah! Like Phoenix, thought never dies.It rises from its ashes again. This post was last updated by Ravi Seth Tue, 14 Feb 2017.